Cabinet Reshuffle: New council of ministers of the Manmohan Singh Govt. Was Malegaon Blast really a handiwork of Muslims? 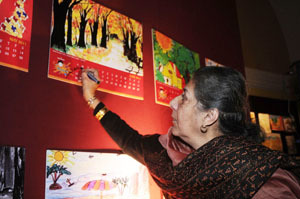 Union Minister for Information and Broadcasting Mrs. Ambika Soni signing on Calendar, at the Official Launch of the Dainik Bhaskar- Junior Picasso, 2011 Desktop Calendar, in New Delhi on January 14, 2011.